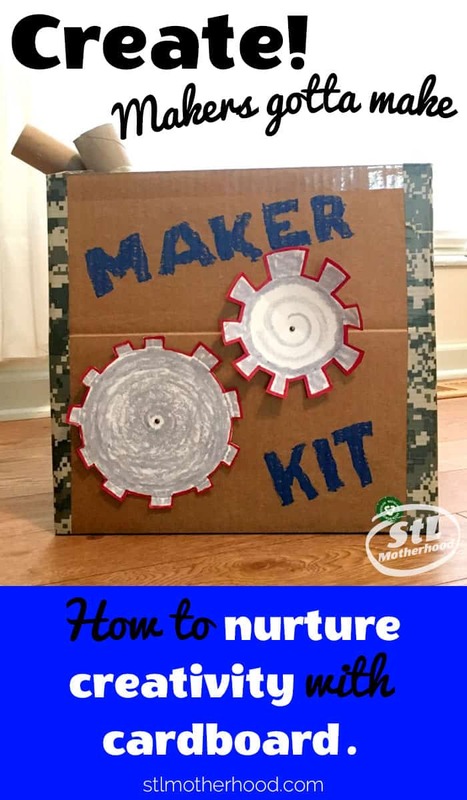 You may have noticed that kids love to play with cardboard boxes. You get your kid a cool toy, and then sit there baffled as they play with the shipping box from Amazon instead. 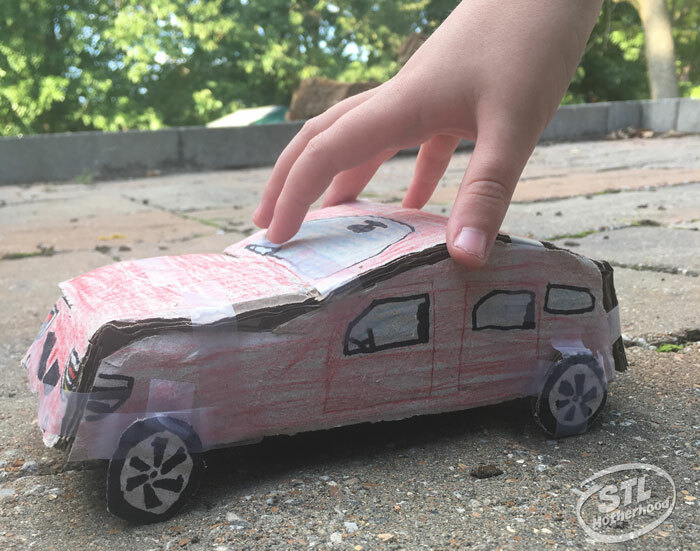 Once your kids get to a certain age–you know, when you can trust them with free access markers and scissors–you can do a whole lot more with that cardboard box. 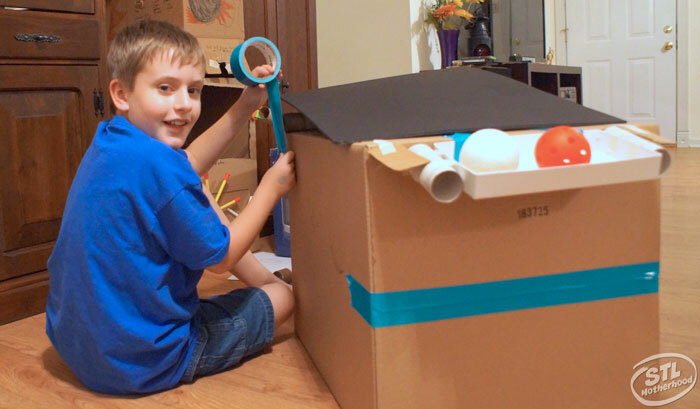 Mitch got super psyched about cardboard creativity last summer when I signed him up for Maker Camp at the Magic House. The camp was all about inventing contraptions, like catapults and scribble bots. 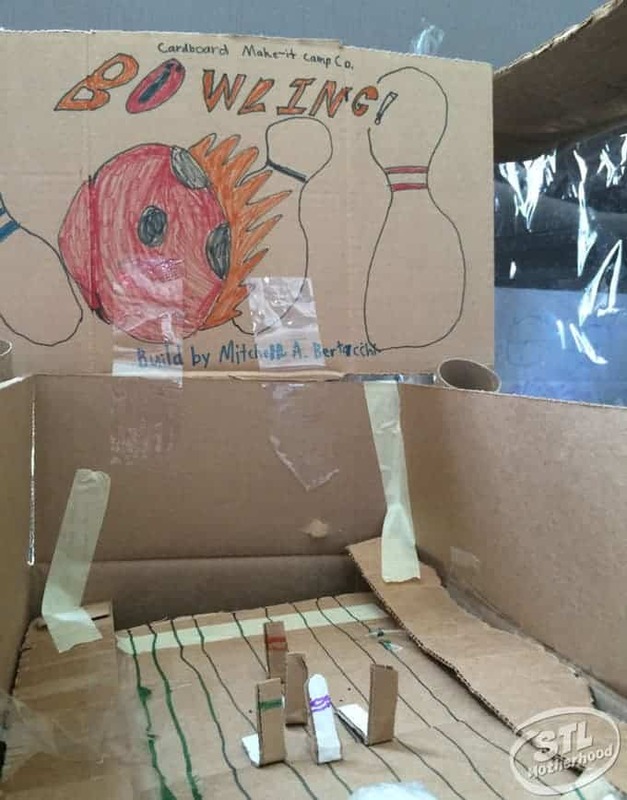 They also made an arcade machine out of cardboard, based on a video called Caine’s Arcade. After the camp Mitch wouldn’t let me throw out a single scrap of cardboard. Since we were sprucing up the kitchen, there was plenty of boxes to play with…and he had plans for them all. He started hoarding toilet paper rolls, bottles, lids and weird bits of packing material. His supplies were starting to take over the living room, so I made him a box to hold his raw materials. 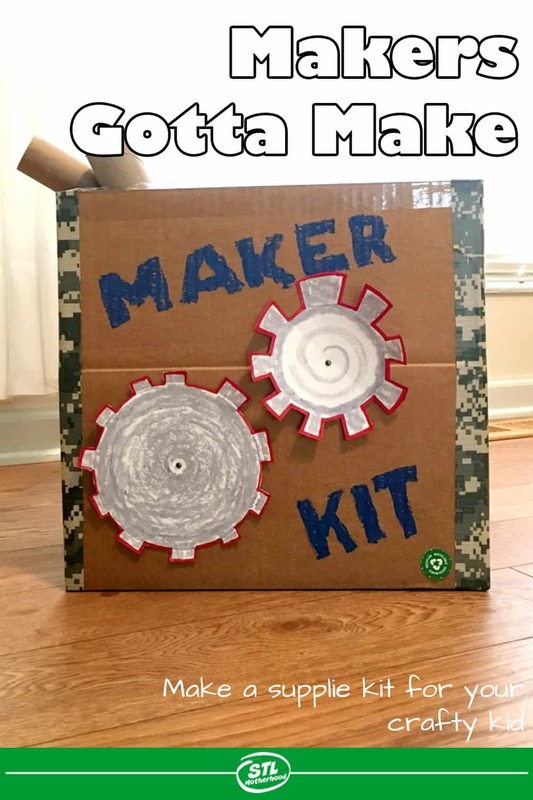 The idea behind a “maker kit” is pretty simple. 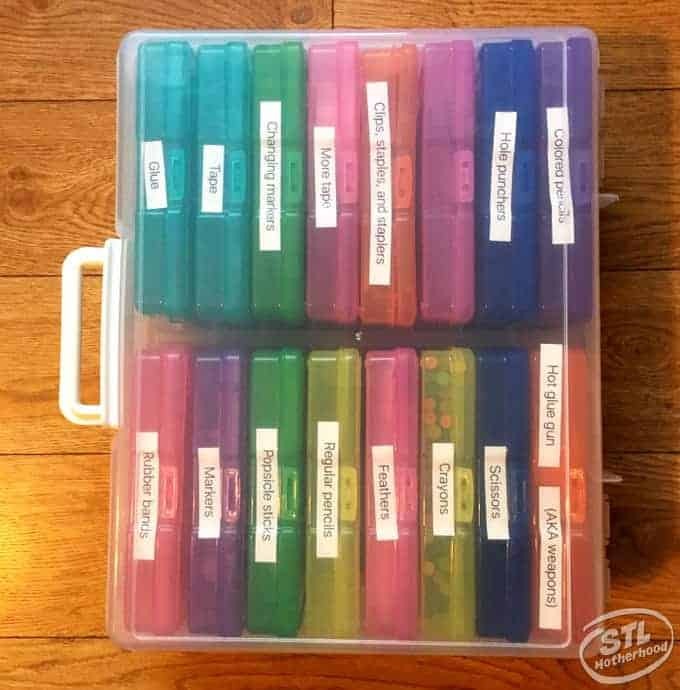 You have a designated box where supplies are stored and keep that box out where the kid can access whenever creativity strikes. You also need to give your young maker open access to the tools for creating: markers, tape, string, scissors. Then whenever they want to get creative they don’t need to ask you for permission–they just CREATE. You don’t have to stop what you’re doing to find the tape, just point to the box. Obviously this only works if you don’t have little ones in the house that like to scribble on walls or cut the dog’s hair. If this applies to your family, please keep the maker kit somewhere out of reach. I’ve tried several times to keep all of Mitch’s art supplies in a central location, but haven’t had a lot of luck. The shelf in the pantry is overrun with crafting leftovers, and the art table in the rec room is buried under scraps of paper. It wasn’t until Mitch decided to use the living room floor as his new art studio that I was pushed to find a system that really works. I bought a snazzy craft box at Michael’s–with a half off coupon of course! This box holds a rainbow of smaller boxes, which I had Mitch label. The size of the box limits the kinds of things we can put in it, but it holds a little of everything. Ok, we had to ask dad to cut down the colored pencils with a saw to make them fit…and the stapler is busting at the hinges…but it fits. Mostly. Now when we need things like tape or crayons, we get the toolbox. And when I find these things on the table (or floor), Mitch knows exactly where to put them away. The box wasn’t big enough for our massive supply of Sharpie Markers or all the colored paper, but having a mobile art box is a good start. Mitch can take the supplies to whatever room he want’s to create and we no longer have to search for the hole punch and rubber bands. Oh, by the way…rubber band balls are a terrible idea when your kid leaves his stuff around the dog. 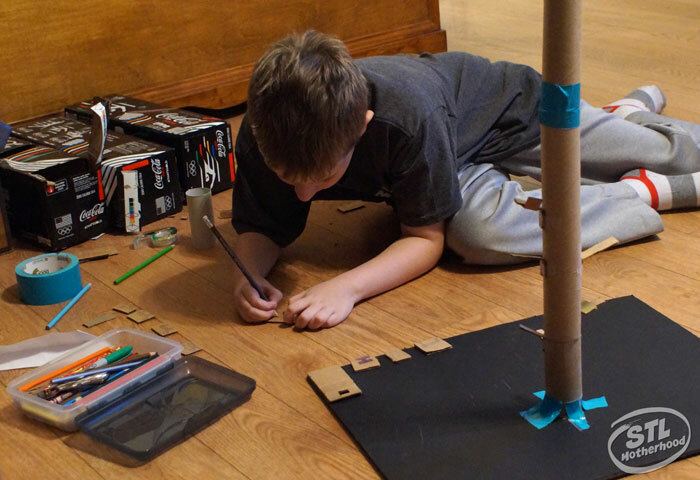 The fun part of setting up a Maker Kit (or art station) is that kids can make WHATEVER THEY WANT. You don’t need to go find a project on Pinterest and sit there with them cringing as they use too much tape and color outside the lines. Just let them go! One of these days I’ll have to convince him that glue is worth the waiting time. I’m pretty proud of my maker! If you follow me on Instagram, you might have noticed that Mitch was on TV not once, but TWICE to help the Magic House promote their Cardboard Showcase this fall. This had nothing to do with me being a blogger, just Mitch being an awesome maker. Ok, a maker who’s blogger mom is happy to pull her kid from school for morning TV. So save that cardboard and break out the duct tape! What will YOUR maker make?